If you want a crystal clear aquarium with happy and healthy fish, a fish tank filter should be the number one item on your list. Although many aquarium supplies will help keep your fish healthy, a good filter is irreplaceable. In this review, we reveal our 5 best fish tank filters that offer the best performance and quality. The best filters in our review are Fluval FX6 Canister Filter, Penn Plax Cascade 1500, and the AquaClear 110. Most fish tank filters usually have several chambers or cartridges, which are filled with different types of filtration media. Different types of media perform different types of filtration, each one vital for the health of your fish. 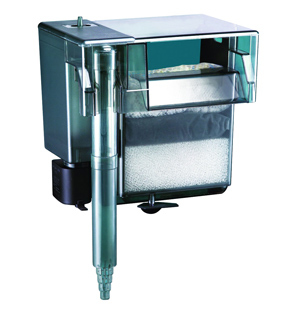 Mechanical filtration removes particles, debris, and dirt from your fish tank. The water is passed through the media – usually a sponge – where any dirt is trapped. The quality of mechanical filtration greatly affects water clarity and the overall health of your fish. Biological filtration (also known as the nitrogen cycle) is a process of removing harmful toxins from the aquarium. All fish release various toxins through their gills and waste. In nature, this is rarely a big deal, but in an enclosed system like an aquarium, these toxins can quickly contaminate the fish tank and poison your fish. A biological filter houses beneficial bacteria that dissolve these toxins, through a process that’s better known as the nitrogen cycle. Chemical filtration removes chemicals, heavy metals, odors, and colorants from the fish tank. While it’s not always necessary, a good fish tank filter should always be have enough space for chemical media. To fulfill its main purpose, an aquarium filter needs to be able to perform all three. We’ve only considered filters that allow a complete, three-stage filtration process. The flow rate represents the number of gallons that a fish tank filter processes per hour. The higher the flow rate, the better the filter. The ideal flow rate number varies from person to person, but we’ve found that the best aquarium filter should have a flow rate of at least 2 times the capacity of the aquarium. This means that a 55 gallon tank requires a flow rate of at least 110 gallons per hour. 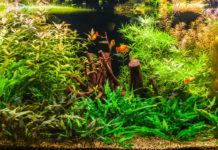 While an aquarium filter with more flow isn’t likely to hurt your fish, a filter with a weak flow rate can lead to unhealthy fish, dirty water, and a number of other issues. This is a common question and a source of many debates. 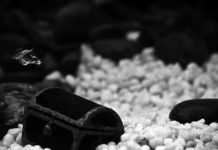 Which aquarium filter type is better? Canister filters will sometimes allow a greater flow rate; but the main benefit of a canister is its sheer capacity. Canister filters are larger than power filters, allowing more room for filtration media. The media can be customized, replaced, and rearranged, allowing comprehensive, multi-stage filtration that’s custom-tailored to your aquarium. Power filters, on the other hand, are usually much cheaper and easier to maintain. While some power filters can be customized, it’s usually to a much lesser extent than a canister filter. The general consensus is that you can’t go wrong with a canister filter. However, a power filter may be a more sensible choice for smaller, non-demanding aquariums, as it will do the job just fine – but save time and money to boot. 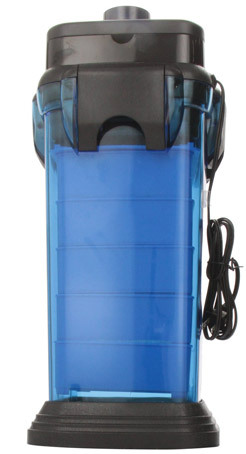 Pros: Excellent filtration and capacity. Many useful features. Cons: More expensive than many alternatives. Our #1 best fish tank filter. 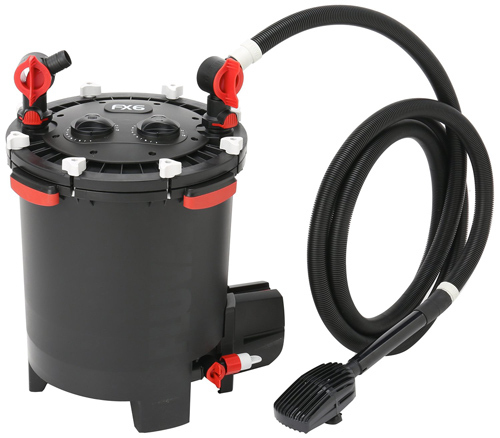 The Fluval FX6 has one of the most powerful motors we’ve seen – with a pump output of 925 gallons, it fully re-circulates up to 563 gallons of water per hour. The inside of the filter is made up of three media trays. 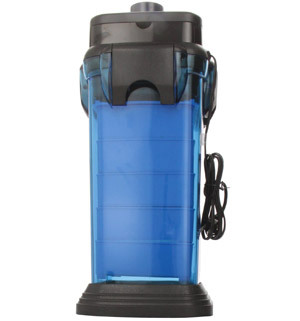 These can be filled with up to 1.5 gallons of biological, mechanical, and chemical media of your choice. Despite its size and power, the Fluval FX6 doesn’t appear to be any noisier than many much smaller filters. The purge valve at the base of this filter makes maintenance much easier, as it allows you to empty the canister first. This allows you to easily carry it to your bathtub or sink, and take out the media trays without spillage. 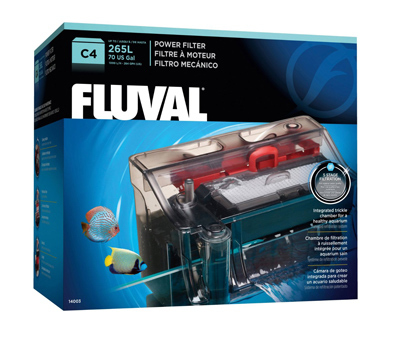 Additionally, there’s no need to manually siphon the filter in order to start it – the Fluval FX6 is self-starting, and fills with water by itself once it’s powered on. Unfortunately, some home aquarium owners might find the price to be too much. 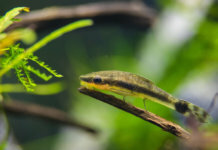 While we believe that the the FX6 filter pays itself off in the long run, some cheaper aquarium filters will do the job just fine in smaller aquariums. 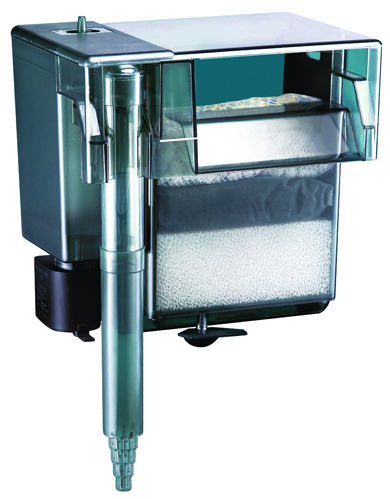 If you own a 55 gallon fish tank or less, we would recommend the Penn Plax Cascade Canister Filter instead. Pros: Five trays for filter media. Cons: Doesn’t have the performance of some competitors. While it doesn’t have the raw power of Fluval FX6, the Cascade 1500 still has good specifications. Its flow rate of up to 350 gallons per hour is enough to ensure healthy water on most fish tanks up to 200 gallons. If you own a smaller tank and don’t need this much filtration, there’s a variety of Penn Plax Cascade models available, made for aquariums from 30 gallons and above. The best thing about this fish tank filter is the amount of media it holds. With a total of 5 media trays, this filter allows you to create a powerful mix of biological, mechanical, and chemical media. While start-up media is included with the Cascade 1500, you can always replace it or add more filtration, depending on what your fish need. Maintenance can be a painful process with most canister filters, but the Cascade makes it a little easier. The top lid on this filter is easily removed, allowing fast access during cleaning. Additionally, five trays of media are less likely to get clogged than three – which is what you’d get with most standard canister filters. Pros: Good price-to-quality ratio. Excellent power filter. Cons: Not as good as many canister filters. The AquaClear 110 has a great output of 500 gallons per hour, and is our best value choice for fish tanks up to 110 gallons. If you find the output of this filter to be too much, you can reduce the water flow manually. This is a good feature for tanks with sensitive fish and plants that require a gentle flow. While we found that although the AquaClear line can’t compete with most canister filters, it still allows quality, multi-stage filtration that should keep up with a heavy bioload. Biological, mechanical and chemical media are included, easy to stock, and easy to replace, as AquaClear produces an entire line of media that will fit this filter. If you find the output of 500 gallons per hour to be too powerful, the AquaClear line has several models of varying sizes, fit for tanks from 5 up to 110 gallons. 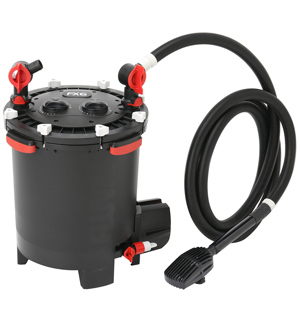 Pros: Extensive 5-stage filtration system. Cons: We didn’t find it ideal for larger aquariums. We found the Fluval C4 to be a very close contender to the Aquaclear 110. 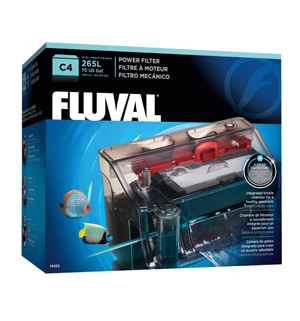 While Fluval’s flow rate of 264gph is weaker, its extensive 5-stage filtration system makes up for it. It’s likely an even better choice for aquariums of 50 gallons or less – at this size, there’s no need for a stronger flow, but your fish will definitely benefit from Fluval C4’s extensive filtration. This fish tank filter is extremely easy to clean – simply lift the lid, remove the cartridges, and rinse/replace the media when necessary. Forgetful fish owners don’t need to worry about maintenance, either. The “cleaning indicator” on this filter will pop up when the filter pads get clogged. Pros: Unique BioWheel system promotes bacteria growth. Cons: We didn’t find it ideal for marine aquariums. 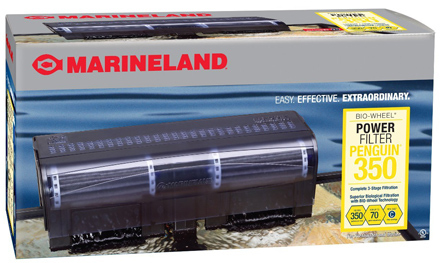 Unlike other filters, which host biological media in cartriges, the Marineland Penguin 350 filter uses a BioWheel. Water passes through the filter’s mechanical and chemical cartridges first, and comes into contact with the BioWheel as it’s released back into the tank. This system has its benefits. It allows beneficial bacteria to come into contact with both air and water, which is believed to promote their growth. Unfortunately, we found that BioWheel filters aren’t the best choice for saltwater aquariums. They tend to collect salt, calcium, and other deposits in the wheel, and this can stunt the growth of beneficial bacteria. Additionally, BioWheel filters can be noisier than regular fish tank filters. Still, the Marineland Penguin has a good flow rate of up to 350GPH and will do the job on most aquariums up to 70 gallons. If this is too much flow for your tank, the Marineland Penguin line has a total of 4 sizes, with flow rates of 100GPH, 150GPH, 200GPH and 350GPH respectively. 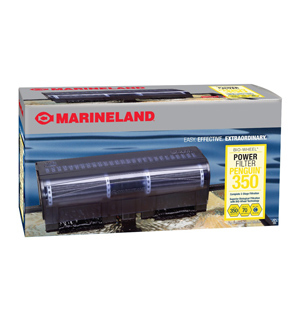 Similarly to the AquaClear Power Aquarium filter, the Marineland Penguin’s flow can be reduced if it causes too much stress to your fish. Note: We work hard to give you valuable and accurate information on aquaristics and fishkeeping. In order to keep this website free for our users, we use links which give us a commission for referring you to the seller. We guarantee that this does not in any way influence our opinions or the content of this website. All statements about the products, unless stated otherwise, represent our genuine opinions, and will remain that way.